A Throwback Thursday post from 2011, a cruise out of New Orleans . I am thinking I should have named this what happens in Vegas, stays in Vegas, but this ain’t Vegas. 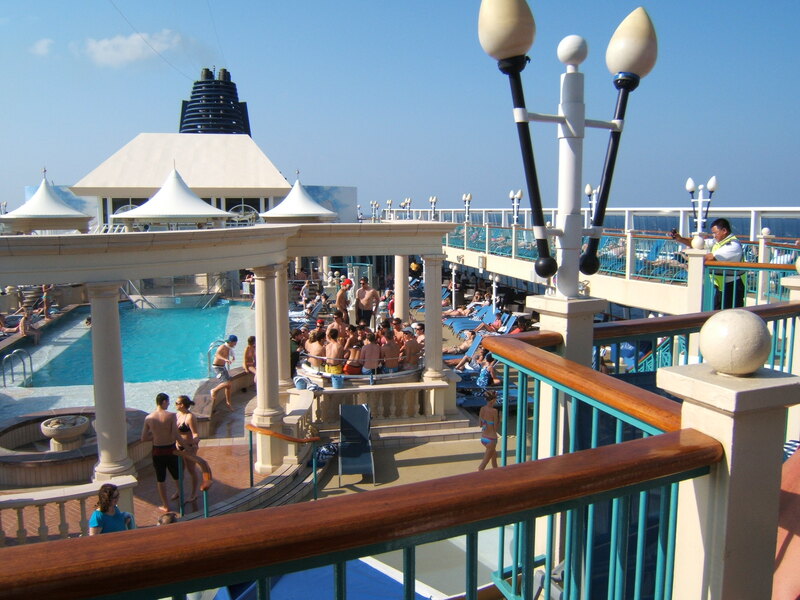 We are cruising into international waters on the NCL Spirit. We departed at 5:00, but first we had to meet up with Gord and Cheryl, who arrived in New Orleans at midnight on the 19th. We had our breakfast, made contact and headed off for our ship. Arrived at about 11, were processed by noon and on board by 1. The day ended in Y so it was time for a drink. We found the pool, and made friends very quickly with one of the servers and proceeded to explore the beer menu. It was extensive. One bucket of Red Stripe (buy 5, get 1 free) later, Gord came up with a suggestion. There is a pub crawl tomorrow, let’s do that. (I’m thinkin’ Gord likes drinkin’). After 6 beer, that sounded great, sign me up. As all things do, the day was moving on and it appeared that it was time to find our staterooms and get ready for dinner. The beauty of NCL is the freestyle dining. Casual dress, no schedule, eat when you want from a large and varied menu. The food was excellent throughout the trip. Prior to dinner though, it was deck time to do the traditional wave to all the people on shore who could care less (probably thinking we are bunch of saps) that we are leaving. Yes the ship was leaving. And leaving, and leaving, and leaving. Apparently, it takes a while to reach the Gulf of Mexico from New Orleans. This got fairly old in a hurry, this leaving stuff, so we left the leaving. Suppertime. As we sat for supper in the Windows dining room, we could look out the aforementioned windows and marvel at the scene. We were still leaving. We ate, had dessert, chatted, got up and left. It was now 4 hours after we had left, and, believe it or not, we were still leaving. Apparently it takes one heck of a long time to reach the gulf. One more stroll on deck, then a show. Predictably, the show was really the cruise lines version of the Home Shopping Channel, but we were there, and some people like listening to Cruise Director’s talk about how great the shopping is on board. After an hour of excruciating pre-shopping , it ended. We decided to head back on deck to check things out, and we were pleased to see that we were no longer leaving, we had reached open water. Feeling satisfied, we headed off for bed. Trying something new to me. It's your time to sparkle and shine !